Club Penguin Cheats by Mimo777 Club Penguin Cheats by Mimo777: Club Penguin: Truly Amazing or EPIC FAIL? I've been thinking about all the amazing things that Club Penguin does for us every month! Think about it! EVERY MONTH they put together incredible parties, free items, they have 2 Nintendo DS Games and other super coolness. Sure, they aren't perfect, but let's just admit how awesome they are! They give us the BEST place on the internet to play! Did you know that Club Penguin is Disney's ONLY online virtual world game that makes money? Pretty sweet! However, let's take a minute to talk about where Club Penguin fails. 6. They took away our TRADITIONAL holiday parties! LAME-O! So what do you think? How would you rate Club Penguin? Has Disney totally messed it up? Does it STILL rock like no other? Has it got boring and lame? Give Mimo a good old RANT and let me know how YOU feel! Play my newest addicting flash game! though CP is a great website it was way better before disney bought it im not bagging on disney im just saying I have had better memories before cp was sold to disney. I think it got really boring...I still go on Club Penguin occasionally. I say that it is awesomealino and coolerific!!!!! I have personal issues agaist Disney™. Epic fail. Most definitely. Disney screwed it up. I remember the old days when missions came out every 4 months or so. They always had the BEST free items and they didn't exclude nonmembers from special rooms. I miss the Easter egg hunts and the Christmas party. It's gotten pretty boring since Disney bought it. I don't play as avidly as I used to. Or maybe growing up has took most of the fun out of it. But I think I'll stick with blaming Disney. *cough* CP is not the only disney virtual world that makes money. Have you ever heard of Toontown or Pirates of the Carribean Online? I think it is both... Amazing And Fail! I wouldn't say Disney messed Club Penguin up, but it hasn't been as good as it used to be. Disney just isn't doing as good as it could do. Whouldnt it be the funniest thing if the next free item was given out by rockhopper at a non member christmas party right after a mission comes out and the free item was toast? On a scale of 1 to 100 I would rate CP a...I dunno. Personally CP could be MUCH better but for the most part they are doing pretty good. Disney is pretty much doing a good job. dude they make member only rooms to make more money cuz u hav to buy a membership to get in member only room...DUR!!! The only reason Disney makes member only rooms is to encourage people to buy membership, the more membership people buy, the more money they make, and the more money they make, the better Club Penguin will get. I love Cp, though everyone on other websites say "it stinks, they never..." and blah blah. they should think about what Cp does do, because most of it is PRETTY amazing. I think it is fair that members get free items, members get to buy things, and they get member only rooms. It is totally fair! Club Penguin has to make money to pay for new technologies and stuff. They are reward the members for paying them. i think it is ok, but i do miss our rilgish ocations. but they give away the same free stuff!!!!! I am a member. I've been here on club penguin for 5 years. YHA! SO i think we need more free stuff!!! its so getting worse they better cange it soon or im going to stop playing!!!!! Well, the old items are good because if there is a new penguin, they can get the item. But I think it was Disney's fault. Yeah, I agree with you. I really miss the Music Jam, Christmas party, and the Easter egg party. These party's were so fun! Mimo, Do you know if the OLD CP is still playable? Like, before they were sold to Disney? I hope so! They had an old skull emote, FREE membership, or so I heard. I'd rate it probably 7 1/2. YOU HIT THAT JACKPOT WHEN YOU SAID TOO MANY MEMBER ITEM. It's not fair. I miss the old times.they brought the old items back, What the point of having a 1225 day old penguin?? You could just make a new one and have the exact same things! Why only let the people that can afford to pay. GRR I miss the easter party, Music jam and the fair. It's preety fair but let the non-members have something!! 1st of all that was funny #7 "no free toast" lol and my answer is it has gotten better at some points and lame at others but hey a game full of peguins no other game like it! OKAY. I don't think this is the BEST time for me to answer this question because I am really ticked off at CP right now. I was just on, and there were all these people basically cursing and swearing in "code" you kno what I mean? THat drives me crazy! This is not the place to do that! UGH! I wish cp would take care of that, but I don't know how they would. POINT #4. All the new rooms... I don't like it. It was way better when there was like 7 rooms. Lol. I don't know if any of you do build a bear ville? But my sister does it and I was watching her one day... There are SOOOOOOO many rooms!!!! And there's hardly anybody in any of them! You could get lost in there. I don't want Club penguin to get like that. I mean the underwater places, the recycling center... How often do you go in there? Me? Never. Okay. All that said. I love cp, I love meeting my friends on there, I love meeting new friends. Thanks for listening to me rant. Please mod my comment, I want to hear what you think about what I just said. Yeah.Its totally an EPIC FAIL.I used to remember in my house,how me and my family used to solve all those missions together like a team.Now it just happens a bit too less,now hat Disney bought it. I think that they are planning something huge. I mean the parties r reduced anymore and same things (free items and member items) keep coming back. There must be something BIG coming... some thing which would change the tables and your grandparents play it! So in order for this BIG thing to come, they need to use less data... which means less parties and stuff so they use heaps of a data thing-ama-jig for this BIG event or something. If nothing HUGE ever comes, then it would be lame-o (times that by 8 shfted sideways). They Ruined it Disney Screwed up CP,I Want Free Toast!! !.And Another Membership for Free! and give me a really old but rare item! I and my friend beleive that disney totally ruined Club Penguin. CP was way better before Disney owned it. club penguin has been going on the down level for quite a while now, esspecially with the going green and no holiday parties but, i still think they are one of the best! Club Penguin is not the only disney game that makes money, disney also have Pirates of the Caribbean online. ...wait!! I got an idea! lets convince CP to get those stuff back! who agrees? Club penguin is terrible now 3 years ago (when i joined) there was like 7 members in the whole game and being a non-member could be cool but now everyone is a member and every one speaks like "pwees can i cumeeee to youw parteeeee." All the non members ever get is a free item they already have. Also there are some rubbish uploads like 1 new postcard or 2 songs for your member only igloo. Mimo your right u mist 1 thing out you cant to the 1 milion glitch disney took it way and stopped a few other glithces. Disney screwed it. Disney has brought us the awesome Club Penguin toys, but the parties are getting boring and I miss Rockhopper. The missions used to be so exciting but now there is such a wait in between you can't follow the story line. Have you noticed that the wallpapers, comics and coloring pages don't get updated fortnightly anymore either? Besides the french toast problem i would rate this game a 9 maybe 9 1/2 idk. Mimo you dont belive this! Go to the hq in cp and read the fish book when you go to the spy phone part click on the attena thingy and a secreat message will appear! Its in Psa code so i think you can crack it. I NEVER go on cp anymore. it is just too boring. and whats with rockhopper only giving out backrounds when he comes??? I mean come ON! and members get EVERYTHING! come on cp, give the nons somthing too! You are right, we have been saying how bad Club Penguin is, when we havn't noticed the great things they do for us. Yes Club Penguin took away some parties, but thats just so they can introduce new things, i mean who wants the same parties over and over again. it is good and bad. i mean, disney has kinda just made it into a big money making thing rather than a kid's game site. wait...they're not using the christmas/music jam/easter egg party anymore? NOOOO!!! And now earth day?really? EARTH DAY? Surppou here. Disney screwed up the missions by miles. The mission comming out on the 18th was supposed to come out last year ago, I think. But I started to get bored of club penguin before disney bought it, and comeon, to all those people who think diney messedm it up completely are at least half wrong. The old club penguin would have NEVER made a medival quest two the same or better than the one now. It is amazing! And they've come up with some great ideas like the orange puffle, the fire dojo and (Sorry if the old club penguin came up with it) the amazing celeb pizza parlor in the penguin play awards. Pirates of the Caribbean online game! These make money and advert ALOT about membership but I think cp makes the most money..
And yeah,they made the Santa Hat on CHRISTMAS(and not holiday) 2006 and they returned it on 2007 and 2008 and 2009!Im not sure but I think it was made on 2005! The Wizard's hat has returned(that was something to expect)! And they returned the red proppeler hat!! AND SO MUCH MORE! 3-Color party(when the dojo was lime green and there was a green cape)! It is a formidable list! Plus that the parties used to be nicer(remember the April fools party 2008 when the pizza parlor seemed like a beautiful painting and the sports shop was in negative color which was so cool?and the pet shop was AWESOME)!Look it up on YouTube or on Google images if you want! Also the Filter chat in my opinion was made specially for 5-years olds!I mean what the??!! Heaven and hate dont show!!! WHA??! and missions are much easier now(check it if you dont believe me)! It's still very good but not as good as before. I miss old cp. Disney stuffed it up. I rember the Christmas 2008. I now realy miss the Christmas partys. Why did they make the holiday party soo lame in 2009? The first time I glimpsed CP, was during a St Patrick day celebration. Everything was green and covered in shamrocks, there was a free hat and some leprechaun outfits. It looked fun-ish. So eventually I joined. I remember when everyone kicked up a stink because of a mission which was delayed ONE month. I'm a member now, but it wouldn't have been one of my future CP aims if it weren't for the fact that so much more is off limits. I agree, after Disney bought it, all became worse... I used to like it very much but after Disney bought it, the standards have dropped. I just quit recently, I'm not encouraging others to quit by me quiting, it's just not fun anymore, I miss the partys and the new cp. Disney and i have problems "I"
i still think disney has messed the whole thing up!, Billybob should talk to RSnail and Screenhog and tell them about mimos campaign Whoo!... i think mimo... that they will delay the new mission till august! and then do some more delaying till 2011! it all will be better if cp could include those cute P564875542's! Make less member-only items (i am a member. i have a personal secret non member account that i use more often than Neoman123... my member account!) Free items should be new and disney... bring the holiday partys back! anyway... just consider all those P112345678998745's when you make a new members only mission or room! mimo, you really should make a new campaign, make the game better for all those little 1st grade kids behind the computer and the 10th grade kids too, make all puffles adoptable by all penguins so it is not rare to se a Non member walking with an orange puffle! now that is only possible if that person had nagged their parent to death like me! to go to KMart and get a puffle, or a toy... witch you are doing realy good on! good job on the stock front... i like disneys idea with Card Jitsu, keep it up... the game is getting more Green! i mean you have a recycling plant, the mine is getting a bit crowded, give it its own personal room and picture on the map! the new games and not new missions have been realy good, since u originaly said feb 18th for the mission, we expect it to be xellent! buy the way billybob... i have been surfing the web, nice office! back to topic it has been ok but i think disney can do better! CP's still pretty cool-- IF you're a member. It's nice if there's a party, but they just keep repeating items. :( Also, I wish they let us purchase something from CP, besides backgrounds and flags, since those things only decorate our Player Cards. I get tired playing Mini-games sice the money will only go to our Puffles and Player Cards. Although, it still has a few good points. I would rate it a 7/10. I agree with you dude. I used to play club penguin all day, now I play occasionally. Another reason (No, not toast!) THEY TOOK AWAY THE SKULL EMOTE! Also, never play toontown as free to play. The game basically screams BECOME A MEMBER NOW!!! Also to all thse people who say clubpenguin is being fair are half right, half wrong. They're bombarding the free players with messages to becme a member, and that new screen that says ''members get more!'' sounds lame. But, Club Penguin does need money to run its graphics and machines. 1. ALL MY OLD RARE STUFF IS NOW THE LEAST RARE STUFF IN THE WHOLE OF CP!!!! 2. I AM PAYING FOR MEMBERSHIP AND GETTING THE SAME STUFF AS I DID A YEAR AGO! it gon a little boring..........but i go on when new things come. Oh yeah, just to add. There was no point. I quit in 2009, because I thought they were not going to release anything good anymore. They have made a big improvement, but the staff need to work harder. ok so, the parties are great on CP and all but theyre only good for like half an hour. i like tootsville WAY better because there is a bad guy (shade) and that makes it more interesting. (CP has herbert but an evil cloud is cooler) also tootsville has more parties like a joke contest and movie night! but i would say that VITs and members are a problem on both websites. CHAOS OUT! ok so i cant agree with some of u that it was better before disney bought it because... I WASNT THERE! but i really dont like CP that much anymore. also i have a theory about the iceberg. ( its chaos theory get it?!) so you know how ppl say u can tip it but u cant? i think u could when disney didnt own it and ppl still think u can but disney took that away. anyway, CHAOS OUT! PS TOTALLY A FAIL. Yeah, your right Mimmo. I only had the holiday parties once or twice. I miss it. I hope CP gives us more parties next year. If I was to rate this from 1-10, I would pick 8.5! I think its awesome and so much fun! Hey Mimo!!! have you noticed the new welcome to club penguin postcard? ?look carefully at it! !the penguin is on stairs on the BACK of the town! !where could this place be!!!? I actually quit Club Penguin since everything is just for members now. Even the member clothes is not very cool but cp is still amazing! offended. on the bright side is they do have 2 ds games. cp was really good before, but after disney brought it you can do nothing as a non-member. CP IS NO LONGER A GAME, IT IS NOW A MONEY MAKING SCHEME TO DISNEY ! I like CP better in the 3rd year it was out. WE WANT OLD CP BACK! Well I say both. I mean before disney they had WAY less parties, missions, etc. Now they have them all. And not good because they take all the good parties out like christmas is now "holidays". And they dont EVEN give out free pie! I remember the beginning of last year when I played it. I called CP and asked them for the Boombox, and they gave it to me. But now CP is all lame. I think it might be because I'm growing up, though. i agree with mimo i liked it when rockhopper came to cp,i loved the christmas party,the old items i've all ready got and i have been waiting for a year for the new misson to come out! You know, I think that is was tottally better when New Horizon had it. members and nonmembers had a chance to experince parties. Now, we get the same free items, like you said.And the parties have to do with something they made up, not an international thing. Yeah, It is getting really boring now. I wish they could make it the way it was back in New Horizon times. Then Disney would be awesome. But, Disney has to something before I really like them again. Did you notice the sports catolog like FEBUARY seriusly? I go on alot! It is kinda boring sometimes, but lately they've been having tons of stuffz going on! Disney did start the club penguin toys but now the best parties are GONE!The last time rockhopper was here was MARCH 13!But as a member, I think penguin quest II made up for some of that.my room is full of gold. i sorta miss the old CP... BUT what I miss the most is the old MIMO777!!!!! Well, I joined CP in 2006, and over the years I've watched it grow, and fall. It's getting really annoying to me and some other rare penguins how they bring rare items back. It's also annoying how they keep using the same items each year. The only items that are different and new are usually the member items. I'll admit though, CP is much better than alot of games out there. Some games you need to pay just to play the game. CP will atleast let you play without having to pay. So anyways, CP isn't that bad, but they should really maybe change how they do things. Like give us a new mission more often like they used to do back in 2006 and 2007. Holiday 9899 Same hear! So boring unless a party. Or mission. I still go on once in a while. But they need new rooms, new games, updates, BRING BACK THE OLD PARTTIES!!!! Every since Disney came along they went down hill. The one and only thing i like about disney.. is Disney Channel. LOL. one time i read in the newspaper rockhopper comes every too mouths BUT they lied :'( yes i think dinsney messed it up and IT would be awesome if they gave us free TOAST! i think it's getting better because since more people are joining they dont have all the free items other people had. So disney is being nice by giving them a chance to get those items. The members only room, they're probably figuring out that more people are getting memberships, so more members, more member rooms! And i think it's fun to have member rooms. If you want to go into a member room, BUY a member ship! It's only 6 dollars! And just because there wasnt a easter party, there was a christmas party even though it was called the "holiday party" it was still the same thing, and to replace the easter egg hunt there was a TRASH HUNT. They ARE making ds games and they ARE making more missions. You just have to wait for missions. Disney is making club penguin better. And cmon admit it, most people that just got a membership WANT rare items. Disney is making it way better than it could've ever been. Epic fail, sadly. They have over memberised the game. Well... They are going green, they have a video at the dojo advertising card jitsu fire, all comics and wall papers now show member penguins, famous penguins G, rockhoper etc. are members if you find them. (Takes breath) Member puffles, copy rooms exactly for Parties. Last new mission was a year ago literally! Member only games and items. Now their is a member only background and pin! add on to this if you guys/girls think of any thing! Got to go eat waffles! i think Disney screwed it up...badly. i remembered that they had less member rooms then now, mission came out without delays, free item...boring,i miss the holidays events, and i haven't seen rockhopper's ship any more. I think cp should make more non-member games and and rooms. Hmm...out of a scale of 10, maybe I'd rate it a 7 1/2 to 8. Disney kind of made Club Penguin worse. Before Disney came along, there were not many or no member only items and member only rooms. Disney already has enough money anyway. Blogger lyla951217 said exactly my opinion of Club Penguin. I agree. some of my furniture and clothing items are gone and replaced with a mean, gray X.
p.s.you are so totally right. And i want my items back! I would give it around 5/10 (or 7/10). And yes I do think disney ruined it all. K now that disney has CP the mods are lazy... Look at the homepage... WHERE IS THE PARTY STUFFF? weird is what i know it is so also like will it be 3 years or somthin before the water ninja comes out? like i am just saying i am bored of disney ruining EVERYTHING NOW! Club Penguin still is a amazing gaming website. But it also has many faults, like many other websites. Maybe we should email Billybob and tell him the ideas that we have for the site. Like bringing back our favourite parties, making less "members-only" rooms and items, etc. etc. It might be hard for them tho think of new ideas. I mean club penguin has been around for a long time... so cut them some slack right? Well this is what I think. I usually go on club penguin often like every day or something but now I dont go on as much because I have soooooo much money but nothing to buy... since I am NOT a member. Mimo777 I would also like to thank you for publishing these cheats because sometimes it is hard for me to find all the pins and stuff.... So thank you!!! I say it has complete awesomeness! remember, not everyone has the old items. Yh i thought i was better b4 disney brought it. CP has gotten really bad and boring! Anyone who's not a memeber doesn't get to do anything cool and I'm not a member because I can't afford it. CP was WAAAAYYYY better before it got sold to disney. The whole thing I still go on for is to play the missions, and there hasn't been a new one forever! Yh me too its getting boring! Hey Maria mimo already figured it out,but well done for noticing! -Clothing: It is very weird now. What happened to the good old stuff like the Roman Helmet? -Parties: No more holiday stuff. Only lame-ish ones like earth day and the 4th of July. They are not very exciting. -To far: They take things to far, like the clothing and games. Look what they did with card jitsu. It would have been fine if they just gave us Ninja Costumes we would have been satisfied. I wish they had an old party, where they take away the stage, dojo stuff, everything like that so we can remember the good old times. Rockhopper comes at every few months I thought.. is it because he didn't come this time? I think it's a... Truly Amazing FAIL! i used to like it alot but than came a new filter. i mean common the new filter blocks every word!!!!!!! 8. mostly when a party comes out a room if for only members. 10. Rockhopper doesn't come that often and random Famous characters. Epic Fail. All of my friends hate the new clubpenguin. Disney took away the meaning to be secret sgents. There are way to many parties. I want the old cp Back. Club Penguin is cool but I wish it had more new items and a non-members only room at a party. i dont think cpub penguin falled and by the way i think club penguin isent the only game they make money from they also have toon town, pixie hallow, and pirets of the carrabien online, and i think maby a game called cars im not sure yet and did you know they had an old vtr i for got the name but they did and they shut it down or something. Actually, sony never owned it. They thought about buying it, but it was too much. Disney bought it from New Horizon. New Horizon and Disney are the only two who have ever owned it. I only go on when there is new catalogs, parties etc. It's getting sorta boring tho! Maybe You Are Just saying That Becuase you Are A memmeber!!!!!!!! I think club penguin is starting to go down in coolness so that is why im going to join lego universe. "hey mimo this might be somethig youd want to see they are in beta stage now see if you can be one please check it out it sounds better than club penguin bey"
Ya It Says: The red light spekks " You Are Cool"
Also Club Penguin is only giving Non-members hat items, you might want to put that on your list too! Instead of toast, they should give out free cake. we want old disney back!!!! YOU HAVE PROBLEMS! THERE MAKING M0NEY AND MAKING IT BETTER! much more! I don't think it's getting boring, but they MUST GIVE US A CHANGE!!! BRING BACK THE WATER PARTY OR INVENT A NEW PARTY!! COME ON CP!! Also Mimo, in the newspaper, in the poetry, on the right page Club Penguin didn't check the spelling of the poem cause instead of Herbert it says "Herbet"! I really blame Disney. They take the fun out of everything. I've never actually been in the old CP (LOL), but with so many disappointed people... I don't know. What happend to the squid in the dojo! I have played CP for 1463 days. Before CP got sold it was the best. Now it is old. Nothing new that is cool comes for nonmembers. I was a member then when it expired. I figured why pay? N-onmembers still get stuff. I WAS WRONG. If I had to rate CP in the old days, before it got sold, I would rate it 9/10. Now 3.5/10. CP was ENTIRELY better not owned my Disney. I don't mind the members only stuffs, but the delayed missions, and the same old items REALLY get old. I'm on another site WAY more now, but I'm still attracted to CP. Well I Totally Agree With You. Disney Should Be Named MadeClubPenguinSuckney. CLUB PENGUIN IS BORING! I MEAN COME ON! PENGUINS! THATS JUST LAME!ITS FOR BABYS! BABYS I TELL U, BABYS!I WENT ON IT FOR WHILE...WHEN I WAS LIKE 6!ALL I GO ON NOW IS RUNESCAPE! NOW RUNESCAPE IS A GOOD GAME! Yeah They Should Make Toast. And Put It In The Coffee Shop. Then We Eat It With A Zebra Headed Rhino! I'm pretty mad as well!! I don't understand why Disney bought it, cuz Club Penguin was doing AMAZING on its own. I would rate Club Penguin 5/10 cuz I mean seriously, I can't stand that they don't have the Holiday parties anymore, and on top of that (even though I am a member on CP) I get pretty upset that they have a LOT of members only items, and the nonmembers get the same old free items which doesn't make anything better. Yeah, Disney has TOTALLY messed it up. Club Penguin was doing so well on its own and all of a sudden BAM Disney comes on the picture and screws everything up. No, I don't think it rocks anymore, cuz I only get on Club Penguin on Thursdays or Fridays cuz that's really when something GOOD comes out. 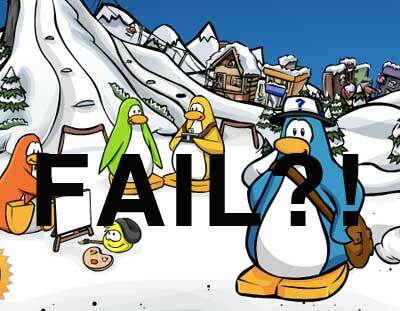 i think cp is a big fail because they take away everything from non-members and charge quite a bit to become a member. and it gets really boring, i never play anymore. the only thing fun on cp anymore is missions and there haven't been new ones in forever. cp used to be fun... but now it's a fail. i like webosaurs a lot better because they have parties like every week and they never have old free items (but if you're a new dino and you wish you could have the old free items, several of them are featured in the catalog each season), plus non-members get more privileges. also, i think disney makes money off of toontown too... disney has too much money, it shouldn't charge for memberships. I rate it a 0.5 out of 10. Seriously. Whats there to discuss? Disney ruined it. And sometimes when you type something out, it never shows up. Well, I guess it was cool in 4th and 5th grade when everyone had one. Now it's just boring as anything. Anonymous said......CLUB PENGUIN IS BORING! I MEAN COME ON! PENGUINS! THATS JUST LAME!ITS FOR BABYS! BABYS I TELL U, BABYS!I WENT ON IT FOR WHILE...WHEN I WAS LIKE 6!ALL I GO ON NOW IS RUNESCAPE! NOW RUNESCAPE IS A GOOD GAME! Well Thats your opinion. And Please don't use caps. Its hurting my ears. Club Penguin Is For All Ages. You know what? I'm SICK (sorry) of Club Penguin now. The one thing, and I mean ONE thing, I wish for, is that New Horizon buys it back, and takes away all the bad things Disney has done. Im sorry Disney, but you screwed up. New Horizon was tottally better. If I had to rate, .5/900000000. I'm really sick of them. They took away the Wigs catalog, wich was so COOl. and I'm just mad. I'm gonna ask them if they could make it like it used to be. If we get so many people to e-mail Club Penguin, they might, just MIGHT, change. They listened to the Select Language. Why wouldn't they listen. I mean think about it... Disney should make it so that the people are happy, so why not give my theary a shot, Eh? Cmon guys, we all want Old Cp back. Let's start a protest!! And Mimo777, if you post something about changing it back to old days, I will never go to any other cheats site, and I will always comment. Basically, New Horizon knew what they were doing, and Disney doesn't. Bring Old Cp back! And remember, e-mail them!! even the music is lame! no more of this *new* techno stuff! we want the older cooler music! Me! Maybe you should E-Mail Club Penguin about this! I know this is tottaly off topic but mimo have u noticed that on mission 1 about aunt arctics missing puffles once you fix the telescope you can look at the plaza rite its kinda funny because its before they had the stage and it has the old plaza. I go on it still. Maybe it was better before disney came.. But I can't even remember that far back! I am sad that they got rid of the hunts and missions coming out faster,and puffle! Cause then it used to be exciting, maybe it's because I'm older, but I'm not all excited about new ones. The goofy orange puffle..Come on FAIL!!! EPIC FAIL!!! Me and my cousin used to be obsessed with Club Penguin, and we always had to be online. We spent all our money on club penguin toys and books. We thought this was our life, until we grew old enough to face the facts; club penguin was dead. I read statistics on the internet that said ever since CP bonded itself to Disney, it had lost 1,500 players in the first week. All video games have started to become money greedy these past few years, and out of that sea of greedy games, there is only a golden few you'll find worth the money. Memberships, in game money, and even cheap plastic figures you buy just for the code have caused games to lose its players that know when its turned rotten. The creators think all kids are gullible and they'll waste all their money on their cheap entertainment, but OPEN YOUR EYES! Use your money on genuine things, or save it for a rainy day. The game is not going to last forever, and when the game ends, you'll look back and see how much money you wasted. Let this be known that many games today, including Club Penguin, are dead all because of its greed. You all have GREAT points, but there is one thing you left out! PIE! Pie is the only thing CP is missing!